I find this whole article historically tone deaf as regards the issue of fetal history. What is a fetal heartbeat? And why does it matter? The idea would have been unthinkable before the advent of a technology developed in 1976: real-time ultrasound. Well no. Auscultation of the fetal heartbeat dates from 1819. It was one of the first method developed to confirm a pregnancy. A two second Google search would reveal that the A-Scan fetal ultrasound had been used to detect the fetal heartbeat since the early 1960s. No, actually, it is the abortion debate that has re-defined what “life” is. There was no debate about the fetus or embryo being alive before the advent of the abortion debate. Until the question of abortion was at stake, nobody denied that the human organism began at conception. The origins of fetal ultrasound lie in stealth warfare. Ultrasound technology was first developed to scan vast spaces, rather than telescope in on infinitesimal cell masses. In the 1880s, the French scientists Pierre and Jacques Curie discovered that they could produce sound waves with frequencies of millions of cycles per second by applying electricity to quartz crystals. Following the sinking of the Titanic in 1912, several scientists and mathematicians experimented with these “ultrasound” signals to determine the presence of icebergs underwater. However, the real push came during World War I, when German submarines blockaded the Atlantic. The French, British, and American navies rushed to develop devices that could surveil U-Boats. The first known sinking of a submarine detected by hydrophone took place in the Atlantic in April 1916. During World War II, the Allied forces continued to dump resources into improving sonar capabilities. After the war, army trained scientists and army funded laboratories demobilized the technology, turning away from the ocean, toward women’s bodies. In the early 1960s, doctors in Europe, Japan, and in the United States simultaneously developed and promoted the widespread use of ultrasound in clinical settings. The First International Conference on Diagnostic Ultrasound took place in Pittsburgh in 1965. That same year, fetal images began to spread across popular culture. Note how she uses the origin of ultrasound in warfare to make it seem like a sinister technology. It is true that ultrasound has its origins in sonar technology, but she blithely skips over the actual story of the development of the ultrasound to make her politically driven point. Ultrasound was developed in 1956 by Dr. Ian Donald, a Scottish obstetrician who, during the war, worked with radar. He applied that same technology as an obstetrician to help women and their pregnancies. There was no sinister attempt to dominate women. It was a humanitarian attempt to help women deal with problems in pregnancy. Ultrasound was then applied to a number of medical problems. But those important details complicate her politically-driven, ahistorical narrative. Before ultrasound, medical care received by pregnant women had depended on their testimony, or how they described their own sensations. 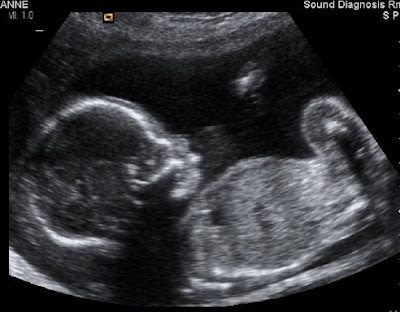 Ultrasound made it possible for the male doctor to evaluate the fetus without female interference. Those sensations are often wrong, and can tell us nothing about what is going on in the womb. Most women who have ever been pregnant and cared about their child in the womb are grateful for the ability to have ultrasounds, regardless of their stance on abortion. Perhaps because most people call their unborn children babies. This is not a “pro-life`invention. Calling a fetus “a baby” has only been controversial in the context of abortion, never in any other context. The passage makes it sound like ultrasound was only begun to be used in the 1980s. As I said, this is not the case. Ian Donald, the inventor of the ultrasound, used it before then. I have often found that many historically-based narratives on the history of the ultrasound, the fetus or the abortion debate often neglect many salient facts to make political points. It’s one thing to have an opinion. It’s quite another to manipulate history to make one’s point. I would also like to take this opportunity to encourage pro-lifers to research these pro-life issues. Many times, feminists make historical claims about the past that do not stand up to scrutiny. Pro-lifers have to be ready to answer those claims. NOTE: A lot has happened since I decided to blog about this article. A number of articles have appeared on my facebook noting how this article has been cleaned up. Somehow I doubt the above facts will be put forward. I mean this is relatively specialized knowledge. But it shouldn't be! Magazine Retracts Claim That Fetal Heartbeats Are ‘Imaginary’. Apparently the original article was even worse than what I commented on, but even the newer version is problematic. Like I said, the idea that the fetal heartbeat is "unthinkable" does not correspond to the historical record. We have been recording the fetal heartbeat since the 19th century. ANOTHER UPDATE: Just noticed she quotes Michael Harrison, and calls him "pro-life." While Michael Harrison is a very important figure in the history of the unborn, as the father of fetal surgery, he is not pro-life. In fact, he works at UCSF, which is notorious among pro-lifers for late-term abortions.